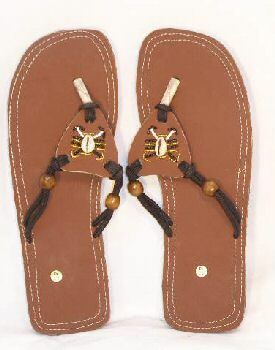 Shining Beetle sandals were hand made in Kenya, Africa by Ndichu in Nakuru. They are “smooth brown leather. The beaded cowry shell panelis connected to the sandal with strong braided and beaded shoe lace. The toe split is padded for comfort. The sole is 1/2″ foam. As sizing is often inaccurate we measure the sole of the sandal. You can measure the bottom of your foot with a ruler and add a 1 – 1 1/2″ in for comfort. These sandals measure 10 1/4” from toe to heel.